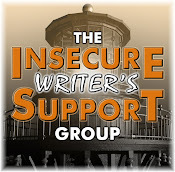 The Insecure Writer’s Support Group is also holding a contest! Visit today for details – lots of great giveaways. My awesome co-hosts today are Julie Flanders, Heather Gardner, Kim Van Sickler, and Elsie is Writing. 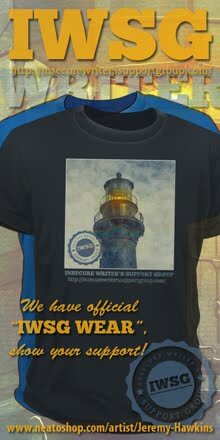 Please be sure to thank them for their time and effort to make all IWSG members feel welcome. I’m in the process of revising my outline yet again. (Yes, I take longer on the outline than I ever do writing the book.) One of my test readers read through it, had some questions, and offered some ideas. So I’m working on details and making some changes. I’ll probably do this several more times and maybe run the outline past one of my critique partners before I get to a place where I am happy with the storyline. I still won’t be ready to start writing it though, because next will be research and world building. And a tremendous amount of both! What started as a simple idea has grown into a complex beast. I wasn’t even going to write another book. Now I’ve gone and tackled a monster. Not sure what I was thinking. Not sure I’m prepared to handle this either. Anyone else ever do this to himself? If you’re still looking for that certain gift for the special geek in your life, or for yourself, check out a site called Geek Alerts. Firefly Serenity Spaceship Ornament available from Entertainment Earth for $9.98. 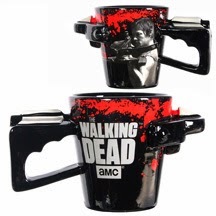 The Walking Dead Daryl Crossbow Coffee Mug $27.99 from Amazon. 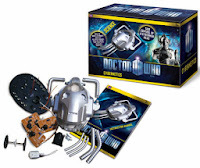 Dr Who Cybernetics Kit at Firebox for £24.99 with free delivery. Toi Thomas’ book, Eternal Curse: Giovanni’s Angel, comes out on February 18, 2014. There is a giveaway and a pre-order special though, so check it out. Congratulations, Toi! The next installment of Hart Johnson’s series is now available – Travel Plans. Congratulations, Hart! Kelly Polark’s latest, Hold the Mustard, is now available. Congratulations, Kelly! Lexa Cain and Julie Flanders are hosting the Dream Destination Blog Hop December 5-8. Since I won’t be posting again until December 9, here is my entry. If I could go anywhere in the world, where would I go? The country is stunningly beautiful. The scenery offers an amazing variety, especially considering the size of the two islands. And no poisonous snakes or spiders! Big plus in my book. Lord of the Rings was filmed there, and I confess I’d also want to see all the film locations. Of course, if I could go somewhere that wasn’t real, I’d visit the Cassan universe. Why? One word – teleportation! Yes, I’d need a Cassan to accompany me and do all the jumping, but it would be awesome. All right, I’m waiting – teleport me on over! Excited about the new books? See a geeky gift you want? Anyone else tackling a project that just might be too massive? And where is your dream destination...? 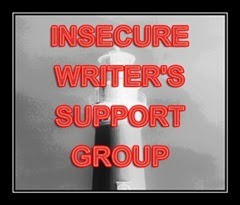 Be sure to check the Insecure Writer’s Support Group for the contest and to visit other participants! I just glad you're writing. Congrats! Love the Walking Dead cup. Congrats to Toi Hart and Kelly. I sure hope you make it to your first choice destination so I can meet you in person! Hate to burst your bubble though, New Zealand makes movie makers take it all, so the tours just tell you what was set where, but it's all gone (at least that's what I have been told. I will do my IWSG post tomorrow and my dream destination the next day. In the middle, I am finishing up my first draft so I can get on to editing. It is feeling massive - again, more on IWSG. I looked through the gifts and spotted that Mason jar amplifier- how cool is that? Congrats on the writing, start of outline and ideas. Today I work only a half day, but I wish to be anywhere but there. Happy Wednesday! This is what I admire about people who write fantasy, historical fiction and you Sci-Fi geeks. The worldbuilding. That alone sounds like the energy it takes to write a book. Love the mugs. NZ - yeah, it does sound like a beautiful place. Awesome you're writing again. And you're so organized in outlining so much. I'm impressed. If evil sea kelp isn't taking over the universe, I'm going to be very disappointed. All I know about sea kelp is it raises your metabolism! I think it's fantastic you're writing another book, but I can imagine how hard it is to change worlds after a trilogy in the same world. Good luck. I'm so excited that you're writing another book. Woot! My SciFi that decided to be a trilogy is going to be like that, with the worldbuilding. Wish I knew something about sea kelp! Sounds like the outline is really coming along. It seems like loads of research and work going on with your outlining, and you sound either wiped or psyched I can't decide. But you realize it only makes your wip stronger. I'm assuming the new novel will be astral! Good Luck, Alex, and keep it up. Rhonda, I'd be happy with just seeing where it happened. Joy, it's like writing two books. Brinda, especially the Firefly ornament. Donna, I ran out of room for more geeky gifts. I want that Walking Dead mug!!! I'm very glad you are working on another book, no matter how daunting. I used to be a "sushi girl" if you can believe it! So the closest thing to sea kelp for me was nori paper, which of course is the sea weed you roll sushi in! Good luck with your outline. Okay, I'd say you are now officially addicted to writing. And yes, my last novel was WAY out of my comfort zone and require a TON of research, so I know how that goes. And awesome ornaments!! I want the Serenity one, too!! And I love the idea of New Zealand for EXACTLY the same reasons you mention! Beauty, LOTR, and no spiders! I'd love to visit New Zealand. I did a ton of research for both of my non-fiction books. You can do it, Alex. Sea kelp? All right, yes, I'm intrigued. I'm writing regular old, realistic fiction and I've been surprised at how much research I've had to do. Alex, yes, I feel very much the same way about the novel I'm writing. I know you can do it and I know you will do it. The geek gift site made me think of the Big Bang Theory and the kinds of gifts that turn Sheldon on, like big green Hulk gloves. Find yourself getting deeper than you anticipated? For sure that sounds familiar. I'm being more of a pantster than a plotter for my WIP and it's been pretty fun, but slow going of course. Good luck! I'm overwhelmed by my story ideas all the time, but I've found that jumping in anyway is the best way to get past that feeling. Once I've got something on the page, I'm better able to see where I went wrong and start fixing things. I love seeing how hard you work on your outline before committing to writing prose. Very different from how I work--and I'm curious enough to give it a shot myself! Ooo...an Oceanic planet chock full of sea kelp with an island that sells sushi rolls! We almost moved to New Zealand when I was a kid. I might have spotted Gollum and the ring! Thank you for creating my Christmas shopping list for me... that crossbow mug is amazing. Oh, you SO have The Engineer pegged...I'll have to show him that. As to the other geek gifts, I want them ALL. Thanks for the ideas! And many, many thanks for linking to me today. Yes, I've tackled projects bigger than I should. Actually, that's kinda the story of my life...type A, leader, get things done...so that would be a YES. As to sea kelp in a space opera, I gave no problem seeing that. Just don't know anything about it except The Engineer found a piece washed up on the beach at low tide in Sitka (on our Alaskan cruise, 2010) and was fascinated with the built in "flotation devices" that make up part of the structure of the plant. Surely a creative space opera guy like the Ninja Captain can make use of a feature like that! Love it! Yes, sea kelp...dark matter nebulas...how to build a cement processing plant...the list goes on and on for a writer, doesn't it? The fact that you were never going to write another book and the complex monster stood up and bit you proves one thing - you are a writer. Sounds like it will be awesome! I love The Walking Dead mug. Too bad it's so darn expensive. Thanks for letting me co-host today, Alex. I love getting out there and meeting new people. World building sounds both fun and a bit scary. It sounds like a ton of work but it must be so fulfilling once it's done. Good luck and I can't wait to hear from the sea kelp experts out there! I must have all the Geeky stuff! 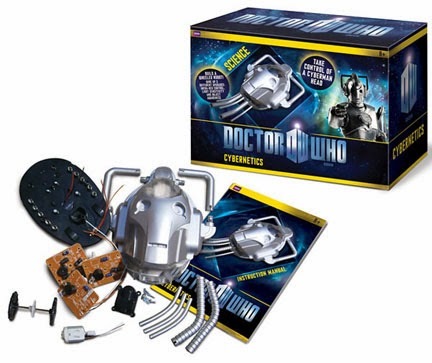 especially the Dr Who Cybernetics Kit! Dr. Who Cybernetics head for me! We were looking at cruises for Australia and New Zealand. It was a month long and lots of $$$. Way past our budget at the moment. But if we could, we would do it. Sea kelp? sure to be very interesting! Wendy, forgot that it's the nori paper - thanks. Chris, those are some good ideas. I'll make it so. Kristen, the harder I work on the outline, the easier it is to get that first draft done. That's my least favorite part. Mike, that made me laugh! Elsie, thanks for helping out. Stephen, a cruise would be cool. Catherine Stine, forgive me, but when I hear the word Sea Kelp, I think of you. LOL. Alex, it's worth a shot. Maybe she can help you. New Zealand's top of my list of countries to visit! And I enjoy worldbuilding - sea kelp in space sounds very intriguing! Oh, I'd love to see New Zealand too! Ever since I discovered Rhonda Albom's blog and her amazing pics I've wanted to go there even more. Thanks for participating in our hop! Good luck with your research, I really admire those of you who do world building. Oh! Forgot to say a big thanks to Alex's co-hosts this month, Julie, Heather, Kim, & Elsie! Your new book sounds exciting. Yes, driving oneself crazy over the details is perfectly normal. I do it all the time. New Zealand - wouldn't mind visiting there myself sometime. Nice choice. Oh, man...your book sounds epic! I can't wait to hear what it's about (beyond the sea kelp, that is). And I want that Serenity ornament! Oh, yes, I did a lot of research into sea kelp for my sci-fi, Fireseed One! Most everything in that world is built from the algae, and most of the food people ate as well. It IS the wave for the future (pun intended). The New York Times had a great article on it a while back with some cool photos of the stuff growing in enormous tubes. Google it, if you haven't already. Have fun with your research! I'm glad you're writing too, Alex. You're such an inspiration. I'm in awe. Candilynn, that made me laugh! And really appreciate you sticking with the IWSG. Julie, I dig Rhonda's blog. Rachel, that's why I do it. Ilima, good excuse to go. Catherine, thanks - I will Google! The novel I just finished for this past NaNo was envisioned as a three parter and there's some elements of world building in the beginning- I introduced two different alien races and some groovy super powers for both them and my MC and the first several chapters, since you can't do reasearch and still make word count, consist of "Insert science-y stuff here". I.E. I WISH I had researched ahead of time and I WISH I had that comprehensive of an outline. It makes sense that that would be the more time-consuming part of it and it certainly sounds like you're on the right track. Either way, have faith in yourself. You've already proven to yourself that you can do it, now you're just raising the bar. As for New Zealand, I can't imagine a fan of the LOTR movies who isn't dying to go! I know I certainly am! Great choice! Great geeky gift ideas! Kuddos to you as you start your next book. You are one reluctant writer! For my geeky boy, I bought him the 2nd and 3rd book by Alex J. Cavanaugh! He read the first one two years ago after I gave him that one for Christmas. He asked for the next two. How fun! Oh congratulations on taking the plunge and starting another book. This story sounds like a big endeavor-- all the best to you as you create your worlds and go where no man has... nevermind. :) Thanks to the cohosts for IWSG today too. I think a lot of stories start out simple then turn into beasts. But it's so much fun. Good luck Alex. I'm adding a couple of those Geeky Gifts to my list. I think I might buy them for myself. I admire your careful crafting before writing. I can do that for non-fiction and have. For some mysterious and yet to be analyzed reason, I can't do it for fiction. I'll see what this contest all about. I love to enter contests. I don't know much about sea kelp, but I'm definitely intrigued! And that's a really good idea to have someone else look at your outline before you begin writing. I must admit that The Walking Dead mug is a thing of beauty! You have a cloning machine? I'd clone myself but I'm pretty sure that will just double my procrastination instead of my productivity. I like that you take so much time outlining, it must be making the writing process easier. There you go Alex. This proves you are a true writer. Story idea and bam, you must write it. I tend to create as I write. I do have a general outline but it changes as I go. World building for me happens the same way. None of the gifts are for me. New Zealand is a great choice. However, if it is only one place for my whole life it would have to be Scotland. I'm totally intrigued with the sea kelp. Go Alex. Love the geeky gifts too! I'm glad you're tackling (and maybe tickling) this new monster, write it up and have fun! That mason jar looks just a little too much like a certain medical device... Oh, the memories. I think it is great for writers to challenge themselves like that. Taking on more and bigger things. I try to do this most times at least when I go to write something. Lots of great gift ideas! I can't wait to hear more about your sea kelp research. New Zealand sounds like a beautiful place to visit, and you'd have your very own IWSG tour guide! Beverly, that is tough to write when you don't know the science details. I like the sound of your manuscript though! Mary, thank you!!! I appreciate that. Lee, I know I want the Firefly ornament for myself. JM, that made me laugh! Rachna, thanks for being willing to 'dive in' for me! Nancy, I've been there - it's awesome! Samantha, that sounds really cool. Sea Kelp? lessee...I stir fry it and eat it. Wait that doesn't help. And yes, I've regularly said, what the hell was I thinking with this world and story. Yep, I there right now. Sheesh. Glad you're planning the next one though. And yes, every story idea I wonder what the heck have I gotten myself into. But you are killer at world building and telling complex stories in a simple way... if that makes sense. It's a compliment... LOL! Me wants that Serenity ornament! I've been thinking and thinking and thinking about my dream destination and I STILL don't know where I'm gonna end up. New Zealand was an excellent choice though. Oh yeah, I've definitely been in over my head in a writing project. I think the worst was when I found myself in the middle of a remote island with misfit vampires, a game show host and a horde of Nazi zombies. It was REALLY fun though, so I'm sure you'll have a blast with that, eh, sea kelp. I totally need the Daryl Dixon crossbow coffee mug. That's all I'm going to say on that :) HA! Good luck with the outline. Sea kelp is very healthy for you too. Sea Kelp, hmm, I know several recipes with sea kelp, does that work for you? I think in your case, what you call outline is the actual writing and the writing is putting the final details like names and The End. Sorry I cannot help you with the kelp but when you need a cactus expert, I am your dragon. Outlining has never worked for me, but after reading your post I wonder if that is because I didn't devote enough time to it. I tend to know my characters and what they will face and start writing, but there's this novel I've wanted to write but never got passed the first 6,000-words. I think I'll try your technique the next time I revisit it. Deny as we might, sometimes fate has its own plans for us, even more work than we ever considered we'd consider. I'm sure you'll do wonderfully on the new book. Love the amplifier and Walking Dead gifts. World building intrigues me, Alex. That's a lot of power, don't you think? Thanks for sharing the gifts for Geeks! I think it's wise to spend a long time on the outline. I always do really sparse ones, and it shows in my first drafts. I'm going to start spending longer on them. I'll be getting a lot of geeky gifts this year, I think. The only problem is, I'll probably want to keep them. Sea Kelp, Fema, boy do we know how to torture our readers. Is your book taking place underwater perhaps? Or maybe the characters have to go on a seafaring adventure? All kinds of possibilities. New Zealand sounds amazing and those gifts would drive any Nerd Wild. My dream destinations are Japan and Hogwarts. What can I say? I love magic. If anyone is capable of building a whole new world, it's you! (And yes, the sea kelp intrigues me!) My son would love that cross bow cup, but the mom in me immediately thinks, ooh pricey and how will I fit that in the cupboard? You're challenging yourself with your next project, something you probably needed to get the juices flowing again! You'll tackle the beat Alex. Of all those gifts I like the mason jar the most. I guess I'm a Luddite at heart. Glad to hear you're writing another book! They always do turn out longer and more complex than we intended, don't they? Sia, you're a step ahead of me in the sea kelp department. Cassie, I've heard that as well! Nicki, yours sounds more fun. Al, when my outline becomes that manuscript, that's when I start writing. Could've used the cactus help with the last two books though. Cherie, if I don't have a plan, I can't even begin. SP, no surprise I am getting a lot of volunteers. Laura, I'd want to keep them! Sheena-kay, oddly enough, it does not take place underwater. And you would really dig Japan. I used to live there. Is it going to be space kelp? I had a feeling the Captain Ninja couldn't stay away from writing for too long. It's in your blood, man. Sorry I'm not a sea kelp expert either! Glad you are in the writing groove though, enjoy that research! Off to check out the IWSG website. Have fun with the outline. I've done world building for all my novel series. I enjoy doing it and continue to learn each time I do it. One of my former students just told me two days ago that she's taking a college course in New Zealand over semester break. Alex, I want to thank you again for the Insecure Writer's Support Group. It has given me the extra little boost I need to keep writing every month. Teleportation - YIKES! I'm with 'Bones' I prefer my molecules unscrambled, please. I'm always trying to tackle a project bigger than I'm up to, but hey, it keeps me humble and busy. Good luck to you and I don't know anything about SEA Kelp, but I did write a creation story for some of my mythical characters once and it all came to me by sheer inspiration. Outlining is a long, in-depth process for me too. I've tried writing without an outline before, but my work ends up being muddled and not making a lot of sense. And I medically NEED that Serenity tree ornament! Hey Alex. I'm just so happy you are writing. Take all the time you need. Wow. Sea kelp? I am afraid that I know nothing about it. I am so proud of you for jumping back in when you didn't think you would! I could only dream of taking less time writing than outlining. Outlining is fun. Getting the words down on paper--now that's where the hard part comes in. Unfortunately I'm sort of at that point in life where I ask for practical things, like a vacuum. The Dr. Who kit would be so sweet though! New Zealand is definitely on my list of places to visit. The Lion, the Witch, and the Wardrobe (newer version) was filmed there too! And no snakes? Bonus points! James, that's good to hear! Ken, that's why it's taken NaNo to get me through that first draft. Samantha, enjoy your Spongebob! And bonus points with the Narnia movie. Hi, Alex. Geeky gifts are awesome. Here is one: http://www.ebay.com/itm/like/271257691554?lpid=82. It's a Spock Live Long and Prosper hoodie. I also want Star Wars Chess: http://www.ebay.com/itm/STAR-WARS-ORIGINAL-3-D-CHESS-GAME-SET-NEW-/271331981271?pt=Games_US&hash=item3f2ca577d7. Okay I'm done. Sometimes I'm convinced us writers love self-torture. World building is fun, maddening and a lot of work, so good luck with it! That outline sounds intense! And yes, I'm intrigued and excited about your latest book writing adventure! Sea Kelp - salty, interesting when it lands on the beach . . . is it the kind that kids use for bull-whips? Love the mason jar idea for my hubs - he could probably make this one too. I love gadgets, very hard not to fill my house up with crap (even more than it is already). Japan is the place I'd like to visit that I haven't got round to yet. Loos cool in the movies. NZ is my pick too. Can't wait to see it someday. I hear its a small village feel to a big country. Pretty cool! And good for you for writing a new story that's making you work!! That's fantastic!! oooh, new zealand is an excellent choice! Don't worry Alex, if anyone can take on the new book challenge, it is you. You are super amazing, remember? 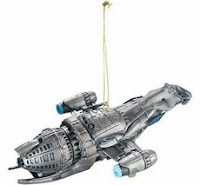 Thanks for the Serenity ship ornament suggestion. My family and I loved that show. I can't believe it was cancelled (sigh). Thank you for everything you have done for us aspiring writers this year. I am grateful. SEA KELP IN SPAAAAAAAAAAACE! Sorry, couldn't resist... YES, intrigued... you outliners are so organized! And THANK YOU for the plug of my release!!!!! I have to add that Serenity ornament to my wishlist!! Love it! Good luck with those sea kelp - can't wait to see what you've come up with! Plus New Zealand is one of the safest countries in the world. Keep challenging yourself, Alex. Of course, you can do it, and it's always a good thing to stretch your skills. Thanks, Alex, it all sounds very exciting, great ideas. Such energy! Carole. Thanks once again for organizing this group, Alex. Best wishes on your outline, research, etc. Once you have all your ducks in a row, your story will flow. I couldn't do all that before starting to write because then I would have already "told" the story. But every writer is different. You have to do what works for you. Alex, that sounds a bit like my process. I had to stop production of my first book for a month to research alchemy. I've learned lately (I'd love to have known this sooner) that Reddit is an excellent resourch for research. I'm telling you - it's smarter than Google. Don't believe me? Go ask it something. I want to go to New Zealand, too! It would be nuts to catch a premier of one of the Hobbit flicks down there! I guess there's only time for one more.. this time next year. My uncle is a botanist and a huge lover of sea... plants. He's speciality is mushrooms though, not sea kelp. Still, I've found that sometimes experts in particular fields are happy to help if you ask them... now that I think about it, I think there is a 'science in fiction' foundation that pairs working scientists with writers in an attempt to get the details as right as they can. It might be worth looking in to. And every project I ever start (unless its a short story) becomes bigger than I can manage. Which is why I almost never get things done. At least not big things. Sigh. I'm so glad that your brain has given you something new to think about all the time. Sea kelp? Nope. Can't help you. I do want those Firefly ornaments though!! World building and research is definitely hard work - but so rewarding, don't you think? I'm so glad you're working on another book. Something for the rest of us to look forward to. I wrote a short story using kelp, but didn't go into much detail about it other than it was green and slimy. I want a Firefly that isn't just a decoration. See any of those around? I took on a monster project once but didn't realize it until I was at 150K words and counting. Deconstruction time! My son's family would love that Walking Dead mug. I'd have to get a set of four. Moody, I lived there - you would dig it! Murees, damn FOX! And glad the IWSG means so much to you. Hart, you're welcome! Pigs in Space. I'd know a Muppet reference anywhere. Robyn, that's what Rhonda said - and she lives there, she should know. David, I will go ask it about sea kelp! I always knew that sea kelp had the makings of a great novel. I ALWAYS start out simple and end up creating a monster of a novel. Simple and straightforward seems beyond my abilities. And Yay! for Hart and the latest installment of her fab serial. When I think of sea kelp, I think of visits to the local aquarium and being around marine life. Oh, and Finding Nemo! Sea kelp....I'm intrigued...and very glad to see you still writing! I'm smack-dab in the middle of doing it to myself as we speak. It isn't pretty. New Zealand sounds like a great destination. Congrats to Lexa and Julie! I will go make the rounds now, better late than not at all! Mary, green and slimy - check! Yeah, starting a new series is a challenge. Ah, you're at the fun and difficult part of the process. Best of luck, and great post, as always! SOOO happy to hear you are writing ANOTHER BOOK! I guess you got all your demons worked out on deciding between music and writing… DO BOTH…. LOL. Wonderful destination choice. But I would DESPISE the 22 hour flight! I'd have to do it in stops. First Hawaii… spend a week there. Then, Japan… another week. Then, New Zealand. What a trip that would be. I hope you make it some day! Alex, that is how I feel about this epic fantasy that I've planned and am about to write! The world-building has turned into a much bigger beast than I imagined. Good luck researching kelp! Will you have to eat any as part of this research process? To answer your question, yes, I'm intrigued about the sea kelp. I can't imagine there not being a good answer to that. How can you not write another book? It's in your blood now. Doesn't sound like it's going all that bad, either. Keep up the great work. By the way, I enjoyed reading this about you and your writing. Good stuff. Sea Kelp hmm. As someone said, it's your world, it can have engineered properties to suit your story. I am not too fond of the stuff for swimming but it makes an ideal hideout for fish. I don't know if you realise, New Zealand is the home of Xtremes like bungie jumping, rapids shooting, parachuting, and anything else you can think of which is basically dangerous. Friend went there a while back and cousin just moved there to live. Sounds like a great place. Of course there is lots of skiing in the winter too. Me I'd go to Japan. Oh nice! Good destination pick. I had forgotten about LOTR being filmed there. How beautiful. You know what else? Flight of the Concords came out of New Zealand as well. P.S. Also nice geeky gifts! oh my those are some geeky gifts, but fun for my boys! New Zealand I hear is such a beautiful place to go! good pick. good luck with the outline...ouch! oh my gosh- a Mason Jar speaker AND a Walking Dead Mug! I can cross two family members off my shopping list! Mega Thanks! and lest I forget.....thanks ever for your so nice comments - I really appreciate you! Big Hugs! Thanks to Kim Van Sickler for visiting my blog, even though it wasn't technically an IWSG post. It's been a while since a co-host has made their way to my corner of the web. One of my New Years' resolutions will be to try and be a more active participant in the group. Really enjoy the camaraderie even when I'm not writing anything specific. Congrats to Hart and Kelly for their releases! Thanks for posting on the DD Blog-hop! I love your description of NZ. One of my CPs lives there! And yes, LotR sure makes you want to visit! Excuse me Mr-I'm-done-writing Ninja. Uh huh. World building is fun. You had like 20 years to build CassaStar; but I'm sure you will get this one done in far less time. You already know how to do it this time. As for taking more time to plot an outline than write the novel; well, the outline is the bare bones of a novel; everything that comes after is just story development. Editing, in other words. But it all comes together in the end to tell the story. Whatever works for you. I want a Daryl coffee mug, even though I don't drink coffee. I'd rather him give me personal crossbow lessons though. Brian, sorry you had to scroll to China. And I though sea kelp would be intriguing! Michael, somehow I will make it work. Yeah, that would be one long trip. Stages would be best. Julie, we can do it! JE, knew that would get people! Jo, I will just watch. Not a thrill seeker. And Japan is beautiful. Used to live there. Chris, glad she could make it. Wish I could visit everyone. Lexa, cool you know someone there. Donna, I know! And that's an interesting way to look at it - that after the outline is the editing. That helps. I NEED THAT SERENITY ORNAMENT!!!! I want to visit New Zealand, too! It's really pretty, and also The Tribe (British series in the late 90s) was filmed there, and I love their accents. Yep, I totally created a monster of a world to write about when I went with post-apocalyptic Wales. And New Zealand was almost my choice for a destination. I really do want to got there some day. It's just so darn far. And sorry about missing the IWSG post. I had a four hour dental appointment yesterday. Yeah. Blah. Looks like your project is growing exponentially, but it sounds exciting. There's nothing like being engaged in your art. And I NEED the Cybernetics kit and the Firefly ornament. Sorry to take so long to get here, but the first day back to work took the starch out of me. Whew! New Zealand is my dream destination. Sigh. One day. rhonda would love to show u around NZ! im so glad you are wrestling with a new monster ms!! im totally intrigued! and cool geek gifts! i love that ornament!! LG, that sounds awful. No worries. Tara, I know she would! I'm glad to hear you've decided to write another book. (monster or not) The book I've been researching may turn out to a monster, too, but I'm trying to bite off one chunk of research at a time. My daughter-in-law would LOVE that Walking Dead mug. New Zealand sounds like a winner, especially since there aren't any poisonous snakes there. Love the geeky gift ideas, especially the speaker, Dr. Who stuff and the Serenity ornament!!! I'm SO happy you started another book! Yea! Good luck with it! New Zealand has always been on my list to visit too! Hi Alex -- yes, I routinely bite off more than I can chew...in many, many ways. Some of us are our own worst enemies. First off, thanks bunches for the shout out on my book. Second, love that Geek Alerts links. Third, new releases look good, especially Travel Plans. Lastly, so glad you are working so hard to perfect your outline. Whatever come of it will be greatness I'm sure. Susan, no poisonous snakes is a big plus for me! Yay. I'm glad you're planning your next project. Fantastic book news. I will check out the links. Loved your space crafts. This youtube site is for you. Tame the beast. Get it under control and you will be most pleased. Glad to hear you are continuing your writing career. I hope you are successful doing your research. I like your method to have your critique partners read through your outline. Wow, that Walking Dead mug is amazing and creepy too. I'm planning a trip to Australia next year. I hope to swing by New Zealand too. You best get yerself there. Do it, I dare ya! The key to tackling a massive project is to break it up into manageable increments, and to have some sort of outline and notes. I've got a lot of massive projects in the queue after my current gargantuan WIP is finished, and thinking about how ambitious and vast they are would create undue stress. A book only gets written a bit at a time, not all at once. You sound like some of my RPG lovin' friends...the work they put into building their worlds is truly amazing and terrifying, all at the same time. I can relate a little bit to your struggle. My last book has a 17th century Caribbean slave as a protagonist. I've got a ton of research ahead of me in order to get the details right. What would he have eaten? Worn? How would he have spoken? It boggles the mind. I think as long as you pick something you're genuinely interested in, you will get through it. But it is overwhelming, for sure. Good luck! Oh yes! I would visit every LOTR film location ever! You're not going to believe this, but I wrote a paper in college on Translocation In The Giant Kelp Macrocystis: Rates, Direction, Quantity of C14 Labeled Products and Fluorescein. Not sure it would be much help to you, I wrote it as a freshman, but the coincidence is pretty funny. Firstly, sorry I missed the IWSG post this month - I was in the UK on hols. I'm back now and feel full of flu, with a whopping cold sore, *groan. 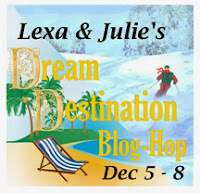 But I'm catching up on comments and Lex/Julies blog hop! Yeah... Right, well New Zealand... yes, I would love to visit (I even marked it along with Canada for a place to retire to, despite never being to either). New Zealand, hey? As an Australian, I resent that. Yes, we may have stacks of animals that could kill you, but our beaches are heaps better! And yes, I've tackled a project that is possibly far too big - a time-dependent three-book series. Eep! Julia, that will be a huge trip! Carrie-Anne, nothing could be as massive as what you work on! Holli, good thing I'm an experienced RPGer! Shah, no worries! Hope you feel better. Cally, I'd visit Australia as well! Good luck with your book. I love when I don't expect to write another book, but then the idea hits me full force. Hi, Alex! Best wishes with your book. My dream destination is almost anywhere we can get to in our van. I'm by no means a sea kelp expert, but I'm thrilled that you've decided to take on a new project. It sort of happens with this writing thing. You start off with one thought, one idea. No intentions beyond that, but the bug comes to nip you with a new idea and you just can't ignore it. New Zealand was definitely in my top five as well. Teleportation to NZ would be even better. Nice collection. Geek gifts are great. New Zealand is definitely my dream destination! Good luck with your monster. :) I am sure it will be a fun monster to tame and all the outlining will really help when it comes to writing. Those geeky gifts are really cool! I think my husband would love the Walking Dead mug, but the trouble with ordering from Amazon is that delivery is SOO expensive if I want it to arrive in a decent amount of time ... I'll have to find something a bit closer to home! Congratulations to everyone on all the book releases! New Zealand does look gorgeous. I'm aiming for Australia first, though. I'm all about rugged red rocks, like in the outback. I'm pretty sure writing books will always feel like getting in over my head, but I enjoy it anyway. Good luck to you! No project is too big for you. Congrats to everybody with new releases. Great destination! I'm in love with New Zealand since I first saw it in Peter Jackson's early films Bad Taste & Braindead. Crystal, your task sounds even more daunting than mine!! Rachel, do a search, and I bet you will find one. Michelle, going to use the Google! Maynard, Brain Dead is an awesome movie! Props for the lawnmower scene. Love the retro-appeal of the mason jar speakers but wouldn't know how to use it if I received it as a gift. Good luck with the next big project! OMG. The Firefly ornament?? I'll take 100. That is so going on my Christmas list this year. The Geek gift list was so much fun! I wish we had a tree just for Serenity! Speaker in a jar? What? That's too cool. World-building is BIG with TOR, so definitely sub your Sea Opera their way once you have it polished up. Good luck! 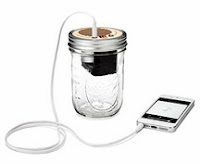 Great idea The Mason Jar Speaker-Amplifier! Whenever the sound is good!